Spalding’s Jenna Snead (25) shields Broadneck’s Reagan Baldwin from the ball during the second half of Tuesday’s girls’ soccer match. 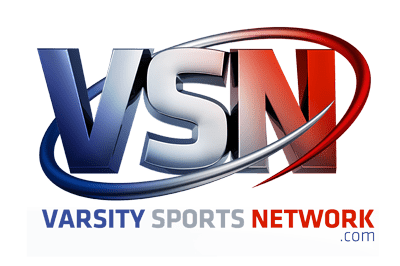 The third-ranked Cavaliers started fast, handing the second-ranked Bruins a 5-0 defeat at Whittles Field in Anne Arundel County. With 14 seniors, Archbishop Spalding High girls’ soccer team has lofty expectations this fall. The Cavaliers have gotten off to an impressive start. No. 3 Spalding posted a 5-0 decision over second-ranked Broadneck in a non-league contest at Whittles Field in Severn. Senior Zoe Lape had a goal and an assist, and senior Jenna Snead and Fifi Iluyomade each tallied. The perennial IAAM A Conference power ceased command early, scoring twice inside the first six minutes against the Bruins, who won the Class 4A state championship last fall. Lauren Korsnick and Zandy Gardner added second half tallies for the Cavaliers (3-0-1 overall). After winning the IAAM A crown in 2016, Spalding’s repeat bid was derailed by upstart Mercy in the semifinals. Mercy lost to McDonogh School in the final. 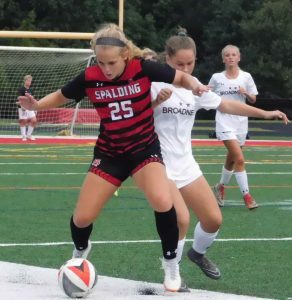 Spalding didn’t take long to establish its “cred” Tuesday as Illyumode scored off a pass from Jessica Zimmerman in the opening minute. Lape made it 2-0, converting a feed from Courtney Corcoran. Savageau turned away Broadneck’s best scoring opportunity in the 45th minute. In the 52nd minute, Snead got a pass from Abby Jennault and blasted a shot into the left corner, making it 3-0. The Bruins (0-1-2) kept a consistent work rate in the second half, despite not having five starters – Tobin Chambers, Caleigh Fletcher, Eva Mowery, Torie Brown and All-Met midfielder Talia Gabarra – because of injuries. Only Mowery, a freshman forward, is expected to return. Broadneck coach John Camm said the Bruins “have no time to put our heads down,” with a key Anne Arundel County league match at 16th-ranked South River Thursday. “We need to make a few adjustments and we need to be a little tougher, but we’ll get there,” said Camm. 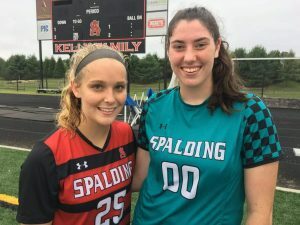 Jenna Snead (left) scored a goal and senior goalie Jillian Savageau made two saves for Spalding Tuesday. The Cavaliers are unbeaten (3-0-1) in the early season. Spalding believes it’s in a good place with IAAM A play starting Friday at St. Mary’s.